Southport Sharks are proud to have one of their key premiership players, Tom Wilkinson selected at pick 41 by North Melbourne Football Club in the 2018 NAB AFL Rookie Draft. 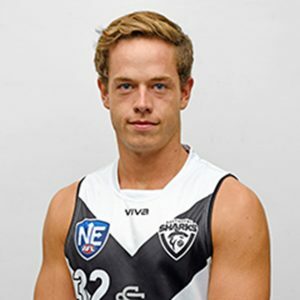 Tom was recruited to Southport in 2018 from Williamstown (VFL). He played 19 games for the season and was a Sharks 2018 NEAFL Premiership player. Tom was a valuable forward and midfield player for the Sharks, kicking 36 goals for the season. “Tom has been an inspirational player and made a great contribution to our season. His intensity and work rate is second to none. We wish Tom all the best with his AFL career.” – Jarrod Field, General Manager, Football.